5 tips for staying out of pain at your desk! Do you sit like this too often? Headache, Neck and Shoulder Pain from Desk Work? Do you spend your work day tied to a desk? Do you forget to take breaks, especially when you get into your work mojo, then next thing you know, it’s been 5 hours straight on your computer? Your back, neck and shoulders are aching, and by the afternoon, you can feel that headache coming on… Ouch! The worst part is, you have to do it all again tomorrow! A huge part of what we do at Mobilise Remedial Massage is treat desk related musculoskeletal conditions. Whether it comes from seating posture, overuse of elbows or wrists, or even weak core strength, many of our patients suffer from pain related to work ergonomics. But what about the mojo?! We know how hard it can be to pull yourself out of “work mode” or “I’ll just finish this section” while you’re plugging away at the computer. However, making short breaks a regular priority will, in the long run, keep you so much further away from that headache. There are some really simple neck and shoulder stretches that can be so beneficial during the work day. Our Myotherapists can show you some that are specific for you, your posture and your work ergonomics. These will help with not only immediate relief, but also address the long term causes of your pain. 3. It’s not only the neck and shoulders that cause slouching at a desk – what is your core doing? Having good core (around the abdomen and lower back) strength is really important for sitting correctly. Finding your stable seating position, and then training your core to hold it, can reduce your slumped shoulder and chin poked postural issues markedly. Switch your mouse hand every now and then. If you turn constantly to one side (reading/talking to customers/the phone is there), change things so you balance out how your head turns. If you use more than one screen at a time, switch the programs for each screen daily. Humans are not well designed for repetitive desk work! Try to change things up as much as you can during your day. Is your computer screen at eye line height? Are your shoulders down and back when typing and your elbows bent to 90deg? Can you reach your keyboard comfortably with your arms in the correct position? 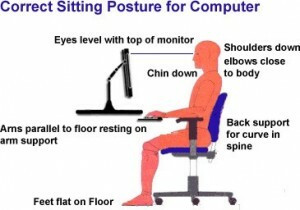 Are your feet comfortably on the floor, and your lower back against the back of the chair? See our picture below for some more ideas on how you can check your work station. Also, does your work offer access to workstation assessments – it’s worth getting your area checked over by a professional, and our Myotherapists can offer specific advice for you. Remember, when you see a Myotherapist, we are able to assess why you are in pain; we can treat the pain, and give you specific rehab, just for you and your situation to keep you out of pain. Come and have a treatment today, call 07 3870 5990 or Book Online for our Toowong Clinic in Inner West Brisbane.